Are you concerned about feeding your dog commercial dog food? There are a number of reasons why you might want an alternative to store-bought dog food for your pup. We will take a look at what they might be, and what you can feed your dog instead of dog food. There are lots of alternatives to feeding your dog commercial dog food. Many of us are afraid to make the move away from dog food because we know that humans and dogs have different needs when it comes to nutrition. And we have been scared by all of the human foods that are toxic to dogs. However, there are all sorts of human foods that dogs can, and should, eat. Not only are dogs allowed to consume them but your pup will probably love them even more than standard, commercial dog food. Nurturing your pup with a healthy, balanced diet isn’t as hard as it seems. It’s true that it will take more time and some additional effort on your part but the benefits to your dog’s health make it worth the effort. Just as we are required to eat a recommended amount of different nutrients over a period of time, so are dogs. Protein, fiber, and fat intake are all equally important for your dog. As are a variety of vitamins and minerals for health and wellbeing. Store-bought dog foods are often made with cheap filler ingredients rather than real foods with balanced nutrients. Feeding your dog these cheap foods over time can result in nutrient deficiencies and lead to health issues. Finding the right balanced diet for your dog is essential for your pup’s health. If you are making the food yourself at home, you will have complete control over what your dog is eating. We have all experienced what it’s like to have a hungry dog, giving you the sad puppy look, and just as you check your cabinet, you find that you’re out of dog food. It’s not going to be fun trying to find dog food last minute. How about when you buy dog food in a bulk at the store because it seemed like a bargain only to discover your dog hates the meal and doesn’t want to touch it? Let’s talk about money. Are you spending more cash on feeding your pup than yourself? If you aren’t feeding him cheap commercial dog food then the answer is probably ‘yes’. Feeding your dog the same commercial dog food full of additives, preservatives, and low-grade meat does not only lack any nutritional benefits but can also make your dog incredibly sick or even give him cancer. The perfect alternative to commercial dog food is homemade dog meals made with real food that dogs can eat and enjoy. So, you’ve decided to change your dog’s diet to a more healthy one and him the happiest pupper in the world. Here are some example homemade meals that you can make for your dog. You probably already have most of these ingredients so may not even need to take a trip to the store. Dogs are omnivores, meaning they can eat both meat and plants. However, their digestive tract responds better to meat because it is such a great source of protein. Beef, chicken, and turkey are all great options for dogs. We all know that dogs love bones but you should not give your dog cooked bones. They are easily breakable and pose a serious threat to your pup as they can choke on the smaller pieces as they break apart. Raw bones from bigger animals are okay to use as a treat, but when cooking a meal, make sure to get all of the bones out. Especially if you’re using bird meat which contains smaller bones. The healthiest way to prepare meat for your dog is by cooking it. Cooking doesn’t require adding any unhealthy ingredients and the meat will retain a good amount of nutritional value for your pup. Some vegetables, like tomatoes and garlic, should only be given to dogs in small amounts. They aren’t life-threatening, but they can cause digestive problems if the dog isn’t used to it. Green veggies, potatoes, and carrots are all great. Both raw and cooked. Include these in your dog’s diet, but don’t overdo it, as too much fiber can lead to constipation. Dogs can go crazy for apples, but oranges and bananas are also great. Fruit contains natural sugars which will give your dog the required energy and a variety of important vitamins and nutrients. Watch out for avocados, grapes, and lemons though. You should never let your dog eat an avocado because it contains a toxin that is very poisonous to dogs. Limes and grapes aren’t that dangerous, but they can cause vomiting and diarrhea in dogs. Arguably one of the healthiest foods, eggs are extremely healthy for both humans and dogs. The egg whites will provide your dog with lots of protein and the yolks contain natural fat and cholesterol. Consuming good quality fat daily is very important for a dog’s health. All you need to do is boil the eggs and remove the shell. Make sure to cook the eggs so the yolk is hard as uncooked egg whites can cause mild diarrhea in some dogs. Most dogs can eat raw fish with bones, but it is best not risk it if you can help it. Salmon is one of the healthiest types of fish there is, and if you have the budget, both you and your pup should eat it once or twice a week. Salmon and other types of oily fish are a great source of protein and Omega-3 fatty acids that are essential for a dog’s diet. Good nutrition plays a huge role in keeping your dog healthy and happy. Switching to homemade human food can greatly increase your pup’s life expectancy and overall well-being and quality of life. Meat, fish, fruit, vegetables, and eggs are all extremely good for your dog. You can mix and match them in order to create various meals and treats for your pup. There are some foods to avoid, like feeding your dog meat with cooked bones inside and other human foods that are toxic to dogs. Do-it-yourself dog food does require a bit more time and effort but will end up saving you money on trips to the vet if your dog gets sick from an unhealthy diet. For more on the perils of commercial dog food and how to design a healthy diet for your dog, see our article on Dog Food Secrets. P.S. 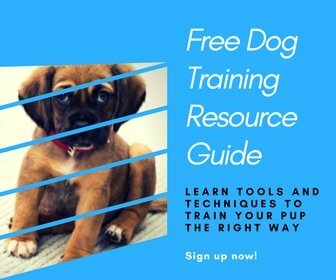 Help a friend learn what they can feed their dog instead of dog food by pinning this!